The same thing happens if you try to use a name that's already used by another file. Notice also that the message doesn't tell you what is wrong with the name, so novice users have to rely on trial and error to find acceptable file names. What's going on, Apple? This is basic stuff! 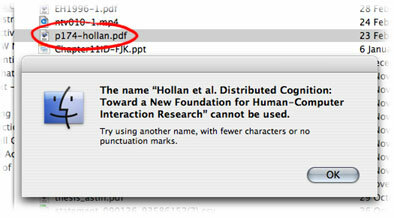 and since OS X used to deal sometimes with OS 9, through the Classic environment, filenames with a colon were illegal. It astonishes me that after more than 25 years of Macintosh, we are still unable to title documents using the one punctuation mark most likely to appear in a title.